Fish Taco’s have been a favourite with surfers, teenagers, beach goers and many locals in California & Mexico for years. We had to make them because they are just too good to miss. A great snack, light lunch or treat for the kids. We have served our Fish Taco’s with Guacamole for an authentic Mexican feel. Fish Taco's made with Mahi Mahi that's been marinated in a delicious Piri Piri seasoning. We are serving our Taco's with homemade Guacamole & sour cream. It's important that you use a firm fish for this recipe because if not the fish will fall apart or become too soggy. Take the Mahi Mahi fillets and coat them in the Piri Piri seasoning making sure as much of the fish as possible is covered. Add to an oven proof dish and bake for 25 minutes until the fish is white and the piri piri seasoning has started to turn brown. Remove fro the oven and set aside. Take one of the mini tortillas and put it flat on a plate. In the centre of the tortilla add a line of lettuce, top it with some cucumber, diced tomatoes, and a few spring onions, then add one or two teaspoons of Guacamole. Take the mahi mahi and gently break up into bite size pieces, they don't have to be even, just cut small pieces off with a knife. 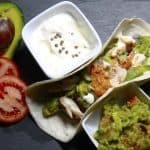 Then add 5 or 6 small pieces of Mahi Mahi to the top of the tortilla, add a little more guacamole and a few drops of sour cream. Repeat the process and make as many as you need (usually 2-3 per person).